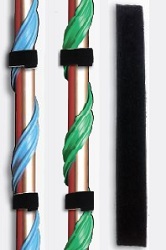 These strips have been designed for the sole purpose of attaching pipe heating cable. Once the Wrap-On pipe heating cable has been installed around pipe, secure it with the Wrap-On Straps. Wrap one strip at the beginning of the insulation and every 10 to 12 inches thereafter ending with one at the very end of the insulation. Strips should be snug. FIBERGLASS PIPE WRAP IS REQUIRED to complete the installation. Wrap-On Straps can also be used to secure the Fiberglass Insulation. Strips should be snug, but not tight when using them with Fiberglass Insulation.